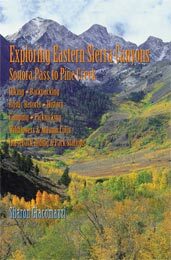 Bored Feet Press carries a great variety of guidebooks for hikers, bikers, climbers, and curious explorers of other types. Whether you're looking for a special place to ride your bike, a place to take a secluded swim, or planning to walk the entire length of the California Coast, we've got your book. Browse the titles and brief descriptions by scrolling down through the list. To view detailed descriptions, use these quick links or click on the title of any of the books. This comprehensive and lavishly illustrated rock climbing guide covers both roped climbs and bouldering from Tioga Pass to Rock Creek Canyon. The best singletrack trails in Northwest and Central Oregon are detailed in this comprehensive guide, organized by region and ability level. This great guidebook to Pacific Northwest trails covers the best singletrack in the South Cascades, the Olympic Peninsula and beyond. With more than 60 detailed trail descriptions for trails of all skill levels. Celebrates the dramatic waterfalls of Colorado’s uncrowded Western Slope, in particular the Colorado River Basin. The Northwest's bestselling mountain bike guide gets even better. It details the best mountain bike trails within 85 miles of Seattle, with the best directions and maps. This book presents useful information on backpacking and hiking with a dog fitted with a backpack. It also tells how the Americans with Disabilities Act allows people who qualify to hike with their pack dog on trails in national parks. The latest Splash Guide covers one or more swim holes in 91 southeastern creeks and rivers in Virginia, West Virginia, North Carolina, South Carolina and Georgia.